Rommel wrote: Thanks for your info. Based on what you said, since Sima Yi could observe the enemy back and forward at the same night I could assume that his army was not far away from JieTing. Could he have different option if JieTing was well defended? I think that Sima Yi would go to Liliu, to a higher plane where Gao Xiang was stationed. Rommel wrote: What was JieTing in the first place? Was it a name of a city? a mountain? a hill? Why was it strategically important? You said that there were 3 ways leading to Chang An & ZGL was on the other road. Why did losing JieTing threaten ZGL? I think that Jie Ting is a name of an area, also a city. This area is critical because it controls the supply line from either way. It's hilly area, but I think it's more valley-ish. Edit: Actually there is the fourth way, the shorter and easier way, which is through Ziwu Valley. But this road is "too obvious" for both sides. Rommel wrote: You said that water was cut off so Ma Su's army was demoralized. Doesnt water flow from top of hill to bottom? How could Sima Yi stop water flowing back to top ? Actually the soldiers would take turn on taking buckets of water from creek down the hill. If the creek is occupied, there's no way to get a water. Rommel wrote: How could a permanent military camp set up on road hold 250k army? There is one possibility. The area is a mountainary area & massive troop movement is impossible but it is also applied to defenders. When the attacking surface is limited to 10 men only it means that for the defenders side it can allow only 10 men showing up at the same area to defend. Or one possibility is that a castle is built between two tall mountains then offenders could have hard time to go around the castle. Based on what I read, when Ma Su set up camp up to hill Sima Yi's army could surround the hill it means the hill is not big or tall enough but Sima Yi's 250 k army could be maneuvered easily. It indicated that the area was big enough for massive troop movement. By the way where were the reserve? Or ZGL didn't prepare for emergency situation? It's hilly area, so troops movement would be somewhat restricted. Sima Yi wasn't mustering all of his 250K troops. He himself commanded 200K troops which he subdivided also between his son Sima Zhao and his general Zhang He. Not to mention Guo Huai and friends. Wang Ping's maneuver was right: Building rampart. This way they could stifle the enemy's advance. Both Ma Su and Wang Ping wasn't ordered to attack at all, the just need to defend and stall the enemy. ZGL did prepare for emergency. See how Gao Xiang was ordered. He was stationed in Liliu but may assist if Jie Ting was under attack. Wei Yan was pretty much guarding the joint point of Jie Ting & Liliu at the Yang Ping pass. Should these two fail, Wei Yan was still there to further delay the advance. "This area is critical because it controls the supply line from either way." What supply are we talking about here? Supply from Shu to ZGL's army? If ZGL was on the different road wasnt supply transported through that road why through JieTing? If JieTing was a city in which supply was stored I believe that Ma Su wouldn't leave the supply dump and station his army on the hills. So I assume that JieTing was not a city but an area as you pointed out but no supply was stored (or Ma Su's army wouldn't run out of ammo). If JieTing was an important strategic spot why wasn't it mentioned on the subsequent campaigns? After Sima Yi took over JieTing why didn't ZGL continue his advance onward Chang An because Sima Yi's presence in JieTing indicated weak defense of ChangAn? While ZGL had WeiYan guarding YangPing Guan ZGL could occupy Chang An and trapped SMY in between. Or ZGL had no confidence on Wei Yan or he had no confidence to take over Chang An? No problem. It's food supply. ZGL was obviously preparing to occupy Chang An and then restocking it with food in short time as the base for his next campaign. Yang Ping pass, about 15 miles west of Jie Ting, where Wei Yan was stationed, is still considered as Jie Ting area. ZGL told Wei Yan that this pass is the "throat" to Han Zhong, where another Shu city that's essentially the gates toward all Yi states (the main provice where Shu was in). Through this Yang Ping pass, come forth the four different ways to Chang An. This is why Ma Su and Wang Ping were ordered to guard this important "pass of many roads". Rommel wrote: If JieTing was an important strategic spot why wasn't it mentioned on the subsequent campaigns? After Sima Yi took over JieTing why didn't ZGL continue his advance onward Chang An because Sima Yi's presence in JieTing indicated weak defense of ChangAn? While ZGL had WeiYan guarding YangPing Guan ZGL could occupy Chang An and trapped SMY in between. Or ZGL had no confidence on Wei Yan or he had no confidence to take over Chang An? Chapter 97 wrote: But Zhuge Liang said, "Due north of Chencang is Jieting, so that I must get this city in order to advance." If ZGL keep marching on Chang An, Sima Yi could easily lay siege on Chang An and kept Jie Ting / Yang Ping pass on check real tight and he'd get it in one month. Chapter 95 wrote: When Zhuge Liang hears that the road through Jieting is blocked and his supplies cut off, he will know that all the lands of West Valley Land is impossible to keep, and will retire without losing a moment into Hanzhong. I shall smite him on the march, and I ought to gain a complete victory. If he should not retire, then I shall block all the smaller roads and so stop his supplies. A month's starvation will kill off the soldiers of Shu, and Zhuge Liang will be my prisoner. Rommel wrote: If the roads between Chang An and YangPing Guan are hilly why didn't both sides set up permanent defensive posts on the way so offense from both sides would be difficult from the start. By the way did ZGL eve take over Chang An? Or he was stuck in the mountains all the time? That's what both ZGL and Sima Yi did. Before Jie Ting fell, Shu had a control of the area. After Jie Ting fell, instead of advancing, Sima Yi put his armies just west of Yang Ping pass in Chen Chang city, where Hao Zhao was stationed to guard it. This city was the target of ZGL's next campaign. I think this refers to the Wei supply lines. Holding Jie Ting well would have isolated Liangzhou and it was the obvious route of advance from Wei to Tian Shui and ultimately Han Zhong. If Shu held the position Wei would have to retake it before hoping to regain lost ground in the west. Jie Ting was likely just a small village, and speaking strictly in terms of defense, the hill was a place much easier to defend. I don't think it was a supply storage area - even Ma Su wouldn't have abandoned supplies so easily. Jie Ting commanded all routes between Tian Shui and Chang An save the Ziwu valley. It remained important strategically, but most of the other campaigns were fought around Tianshui at places like Chencang and Qishan. Wuzhangyuan was south of the location along the Wei River - Zhuge Liang bypassed the Jieting area in his last campaign. If Sima Yi had Jieting, the only way Shu could attack Chang An and remain supplied would be through Ziwu. But doing so would leave Tian Shui open to attack from Jieting. Kongming saw the problems of an attack through Ziwu, and focused his efforts on beating Sima Yi north of the Wei river from Tian Shui to An Ding. If those areas fell, Shu could safely occupy Liang and Chang An would be the target of all future Shu attacks. Once in this position Wei could not hope to win in the west. If the roads between Chang An and YangPing Guan are hilly why didn't both sides set up permanent defensive posts on the way so offense from both sides would be difficult from the start. By the way did ZGL eve take over Chang An? Or he was stuck in the mountains all the time? Shield of Rohan wrote: I think this refers to the Wei supply lines. Holding Jie Ting well would have isolated Liangzhou and it was the obvious route of advance from Wei to Tian Shui and ultimately Han Zhong. If Shu held the position Wei would have to retake it before hoping to regain lost ground in the west. If Jie Ting refers only to Wei supply line, why ZGL rushed to withdraw from attacking Chang An when it fell. I notice that Jie Ting was far northwest from Tian Shan and even further from Yang Ping Pass (from William's map). It's not what I would imagine since it seems to me that Yang Ping pass was only 15 miles away from Jie Ting. Shield of Rohan wrote: Jie Ting was likely just a small village, and speaking strictly in terms of defense, the hill was a place much easier to defend. I don't think it was a supply storage area - even Ma Su wouldn't have abandoned supplies so easily. Agreed. But why the novel said that "it has no natural defenses"? Was LGZ being inaccurate? I guess that despite being hilly, this place was sort of easy to attack too. Shield of Rohan wrote: Jie Ting commanded all routes between Tian Shui and Chang An save the Ziwu valley. It remained important strategically, but most of the other campaigns were fought around Tianshui at places like Chencang and Qishan. Wuzhangyuan was south of the location along the Wei River - Zhuge Liang bypassed the Jieting area in his last campaign. If Sima Yi had Jieting, the only way Shu could attack Chang An and remain supplied would be through Ziwu. But doing so would leave Tian Shui open to attack from Jieting. Kongming saw the problems of an attack through Ziwu, and focused his efforts on beating Sima Yi north of the Wei river from Tian Shui to An Ding. If those areas fell, Shu could safely occupy Liang and Chang An would be the target of all future Shu attacks. Once in this position Wei could not hope to win in the west. Considering the map, I hardly believe that Jie Ting would easily put Tian Shui in check. The other way round is much more feasible. I think that the map is wrong. robbyjo wrote: If Jie Ting refers only to Wei supply line, why ZGL rushed to withdraw from attacking Chang An when it fell. I notice that Jie Ting was far northwest from Tian Shan and even further from Yang Ping Pass ([url=kongming.net/novel/i/map_rtk.jpg]from William's map[/url]). It's not what I would imagine since it seems to me that Yang Ping pass was only 15 miles away from Jie Ting. If Jie Ting was in the hands of Wei, it basically told Zhuge that his plans were not yet complete. With the Wei army still running around in the An Ding region and crucial Wei centers not yet conquered, it was not yet safe to besiege the city. 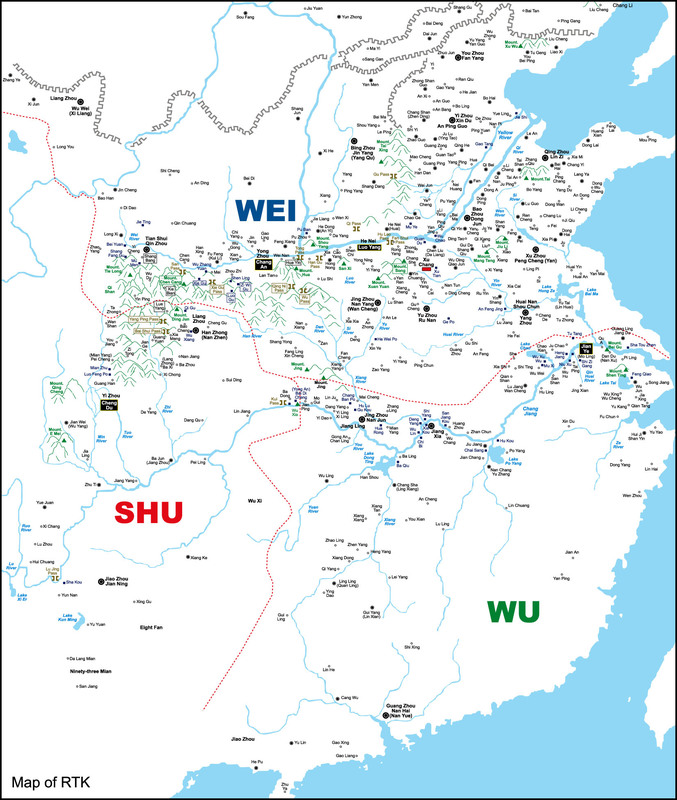 Wei needed to hold Jieting mostly because it was the gate to Liangzhou, and if Shu had it and they tried to regain Tian Shui, it would be just as bad as Wei Yan rushing through Ziwugu forgetting about the armies north and west. If Shu held the area Liangzhou was cut off, and any armies venturing south and west of An Ding would be vulnerable to Shu forces in two directions. I was surprised too, as I thought it was almost between Tian Shui and An Ding, halting any Wei forces from that area. It now seems more like a flank, and less like a central position in the campaign. Well, a hill isn't much of a defense on its own, but it is better than a small village. In this case though the hill was an unsupplied one, and as such turned out far less defensible than the valleys. I suppose what I am trying to say here is that without Jieting, neither Shu nor Wei could advance successfully to Chang An or Tian Shui. Leaving a flank open, especially one that ultimately contained Liangzhou, is not a good idea. It will be my last post of the day. I will explain why I think that JieTing was not defendable. Put the battle of Jieting aside let us look at the battle in the movie of "lord of ring" Part II, in which 100,000 orcs were ordered to take over ??? keep (forget the name). The walls of keep look concrete to me and the keep was built as multiple layers of walls. The elves, archer masters, were dispatched to help out the defense. The orcs didn't use any fancy tricks, just plain old attack tactics, rams, ladders, massive continous attack wave. The defense didn't last for long before the orcs broke through the fortified castle. Let us look back to JieTing. Ma Su was given 25k soldiers and had to set up defense in a short period of time before Sima Yi arrived. If he set up camp on the road, it wouldn't be concrete because 1) didn't have the technology 2) didn't have enough time. What he could do was to set up wooden walls mixed with sand like enlarged fences. Did he have enough time to dig up a moat? I dont know but i doubted it. Besides he could lay down obstacles in front of camp. What kind of obstacles could he have? There were not tank teeth, iron wire, or mines used for defense in WW2. He might have rotten woods . For offenders, I dont know when Sima Yi's army arrived. If they arrived at the battlefield during daytime, they would wait till night to start the offense because offenders had time to survey surrounding then make up offense plan & to rest & to replenish energy while defenders waited anxiously for the next move of offenders, which inflicted their morale. More importantly night attack could enhance efficiency. If they arrived at night they could launch attack immediately. In the darkness, Sima yi could order 1000 archers or so (dont need a lot) to shoot fire arrows against the wooden walls. With flame up to sky offenders could see movement of defenders while defenders had problem to locate offenders. When the walls were burnt down a continous wave of calvary attack with 500 each flanked by infantry men could charge down the camp. Remember there was no natural barrier to help Ma Su out and if he set up camp on the road he couldn't have advantage of height then his men couldn't throw rocks against attackers. So do you think that such kind of defense could last long against enemy of number of 10x of your foce? I believe that Ma Su tried to set up camp on hill to enhance his defense with rocks involved. Sima Yi used fire attack anyway. Besides, Sima Yi applied art of war well here. Based on art of war, if you have 10x number over enemy dont attack just surround them and force them to surrender. It was exactly what Sima Yi did. In conclusion, JieTing couldn't be defended for long from my point of view. I dont know how far ZGL's reserve were away from JieTing. Their reaction was too slow or their location was too far from Jieting & the number was too less to handle the situation. I can't picture how a reinforcement of 10,000 men can turn the tide of war by fighting against 200,000 men. The battle of Jieting was doomed to failure from beginning. The ancient rules of war do in fact state to always take the high ground, but not to pitch camp there. Barricade and defend the choke points to the main road, and dispatch a small number of your soldiers to secure high ground, but if you are isolated on a hill, you will easily be defeated. Zhuge Liang's purpose in Ma Su was not for them to permanently hold Jieting Pass, but to delay until he arrived with the rest of the army.